This conservation resource was created by Skye Jarvis. For many decades, statistics have shown a significant decline in African elephant populations due to a lack of regulation. Governmental corruption and political instability in Sub-Saharan African countries allowed the ivory trade to occur for centuries. Lack of regulation contributed to the continuous degradation and exploitation of natural resources. The current decrease in elephant populations is primarily due to illegal poaching, demand for Ivory products, and factors associated with human population growth. Curbing illegal poaching of elephants for ivory depends on a decrease in the demand for such priceless products. Secondary causes of population decrease include habitat fragmentation, as well as the alteration of age and genetic distribution within existing elephant populations. This issue has severe ecological repercussions, as African elephants are keystone species within the the continent's landscapes. They perform a vital role maintaining ecosystem balances within African savannas and forests. The disappearance of African elephants would impact successional environments. Altered ecosystem dynamics would effect seed dispersion and soil quality, as well as the physical features of the environment and biota inhabiting it. African elephants are a globally recognized animal who play an important roles in many local communities’ religions and cultural identities. African elephants also share the same intrinsic existence value as humans and all other organisms, which must be recognized and respected. Due to expanding human populations and our associated economic, political, and societal drivers such as poaching, international trading and governmental corruption, we have come to reshape Earth. Competition for space and resources continuously increase as humans push ecosystems to their limits by exploiting natural resources. Ecosystems provide valuable services and materials which are essential to our security, health and well-being. Anthropocentric strains on the Sub-Saharan Africa environments and ecosystems continues to fuel the extirpation of African savanna elephants from their ancestral range. The rate of extirpation is unsustainable and if continued will lead to the extinction of another animal species. 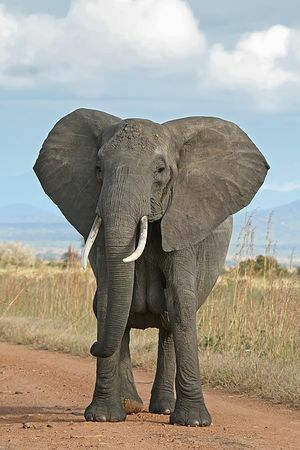 Within the modern Elephantidae family there are three species: African savanna, African Forest, and Asian elephants (Elephas maximus) as well as several noted subspecies . 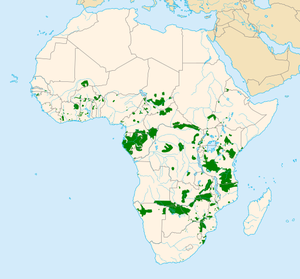 The major species on the African continent are the African savanna elephant or African bush elephant (Loxodonta africana) and African forest elephants (Loxodonta cyclotis). African savanna elephants have historically covered a wide range of habitats including deserts, marshes, open woodlands, subtropical savannas, and tropical grasslands. African savanna elephants avoid forests by choice. The African forest elephants, on the other hand, are mostly restricted to the tropical forests and local savanna. Declining African forest elephant populations are more difficult to track and monitor due to their dense forest habitat. These prodigious mammals have descended through evolution along many paths, with predecessors including the woolly mammoth and stegadon. Elephants and their ancestors have been a traditional source of materials and food for ancient humans and many local African communities and still are today. An international convention between governments has lead to the creation of CITES - Convention on International Trade in Endangered Species of Wild Fauna and Flora. This intergovernmental body works to regulate the international trade of protected animals and animal products including ivory since its creation in 1989, however despite their efforts, domestic ivory trade continues in many countries . Eradication of a keystone species leads to the cessation of any symbiotic relations to which that species once contributed. Following this loss a series of trophic cascades will arise driving the deviation of various interconnected populations within multiple ecosystems, creating a ripple effect. Similar ecological repercussions could from elephant extinction, such as the well-stuied case of the loss and reintroduction of grey wolves (Canis lupus) in Yellowstone National Park. The extinction of such a contributing interconnected member would be devastating to extents humans cannot fully predict. The Global Ivory Ban of 1989 had many ripple effects, both legal and illegal. The years following the ban saw a major drop in both the number of elephants killed and the amount of ivory sold on the black market as poachers were clearly afraid of being caught and prosecuted. However, the last five years have seen a dramatic increase in poaching levels and the profits being made off illegally sold ivory from black markets due to lack of enforcement across Africa . Poachers are becoming more tactful to reap the rewards of increased prices within the black market, driven up by high demand for ivory. To choose a winner in the ongoing ivory trade, one must first define what winning is. Undoubtedly it would be described in human terms, winner as given by http://www.dictionary.com/ is the person who reaps all prizes and rewards after a situation or outcome. So in this case we know that elephants would be the losers and humans would be the winners. Our technology and cunningness outmatches those of other animals. These include both those positively affected and those negatively affected. People who are impacted by environmental issues are stakeholders and should be considered and involved in the planning and management of local issues. Drivers can be direct where their actions change ecosystems, they may be natural or anthropogenic; some examples include natural disasters, land transformation, invasive species relocation and external inputs like fertilizers. Drivers can also be indirect, attempting to control how humans interact with their ecosystems which alter the effects of direct drivers. Some examples of indirect drivers are consumer demand, technology and governance including religion, social norms, and institutions that occur within human cultures. Threatening elephants' existence is the very thing it has evolved, ivory tusks. Could it be that elephants themselves are a driver of their own demise- not snuffed by natural selection, but from a different kind of artificial selection based on a "desired trait" that is "selected for" by humans? Tusks are actually incisors which are similar to rodent incisors . They are constantly growing and being worn down throughout an elephant's life. Many other animals have also evolved tusks including walruses and warthogs. Juveniles go through a similar process as human children where they loose a set of milk tusks . Ancient human societies long realized the hardy elephant’s ability to learn commands and provide valuable labour. Captured using a combination of pit and herding methods, elephants have been utilized for thousands of years in zoos, circuses, ceremonies, wildlife parks and work camps . In many African cultures elephants symbolize strength and power. They also play a significant role in traditional culture and beliefs. Elephants have historically been a source of food, materials, and wealth. They have influenced art in African cultures and are portrayed in an array of different forms, all of which depict size and power. In cultures where African elephant populations have declined drastically or where they have completely disappeared the elephant continues as a symbol. The elephant is represented symbolically in African religion, art, and histories. Elephants are large herbivores that require a large home range and many resources to sustain their growth and reproduction needs. Habitat loss threatens many animals including the elephant's survival. Savanna elephants digest a wide range of foods including scraps of bark, chunks of roots, many different grasses, leaves, delicious fruit, flowers and human crops all using their tusks and trunks . Elephants are giant roaming gardeners who disperse seed and natural fertilizers helping the succession of vegetation and cycling of nutrients which provides resources to other animals and future elephant generations. Ecosystem services are vital to the sustenance of healthy elephant populations, who depend on the provisioning (food, water, shelter), supporting (nutrient cycles, Carbon sequestration) and regulating (storm, flood, drought protection) ecosystem services. Holbrook, (1977) states “the sensitive trunk can smell water underground”. These goliaths also require gallons of fresh water to stay hydrated as they migrate through dry environments, they have been known to use their tusks to dig for water in deeper soil . Once the herd moves on other animals are able to drink from these homemade waterholes. This may be especially beneficial to other animals during the hotter months of the dry season. Consequences of ecosystem changes threaten provisioning services that provide food and shelter. As human populations grow, there is a greater need for resources, often is connected with exploitation . Inhabiting remote lush jungles, elephants and other animals face imminent eviction, starvation, or death at the hands of deforestation and degradation. Once pushed out of their protective homes, these grey giants are more visible to poachers and other predators. Deforestation leads to the cessation of many supporting and provisioning ecosystem services available to other animals, creating unstable forest ecosystems which are unable to support healthy populations. Elephants have been said to ruin large portions of vegetation, pulling down branches, crushing bushes and small trees while flattening grasses and fields of crops. African farmers know a whole herd of hungry elephants can be devastating to their fruit trees and crops, impacting the farmers' sources of food and well-being. Hot chili peppers have been experimented with and seem to work efficiently as a natural irritant to their sensitive trunks . Beneficial examples such as this help to attest that humans can solve some environmental issues by practicing cooperative methods that better manage human-animal conflicts. Desirable properties of ivory have created a huge niche of workable products available for trade to areas such as Southeast Asia and China, with “nearly all of the current demand for elephant ivory coming from the Chinese market” . In previous years, before the world’s huge increase in population, this thriving trade was vital in building a country’s GDP, however now “there are simply not enough elephants in the world to satisfy the growing demand” . 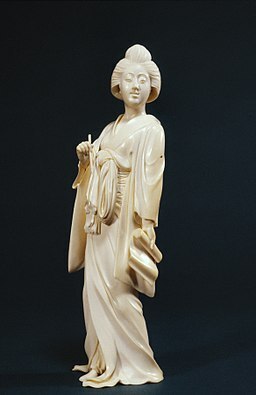 Ivory was highly valued in earlier centuries by rich European countries. These ivory products arrived by boat loads in early colonial expansionism of the 1700s and 1800s. In the years prior to the late 1980's the ivory trade was still legal, the population of African elephants decreased by almost two thirds and made world leaders rethink the legal killing of elephants for ivory. In 1989, the Ivory Trade Ban was introduced in order to allow elephant populations to increase again, however some parties managed to avoid this ban through illegal poaching and selling products on the black market . This is the greatest problem facing elephant populations today, with up to 90% of the ivory sold in China being illegal  and around 35,000 elephants being killed every year to meet ivory demands across the globe . If the nations of the world continue to kill elephants for their ivory there simply could be no elephants left at all. Along the ivory supply chain in Sub-Saharan African countries, corruption is the primary impetus behind the significant quantities of elephant tusks being exported annually. Governmental corruption is defined as the unlawful use of public office for private gain . One aspect of this corruption, in countries such as Cameroon, is that when wildlife rangers go unpaid by the government for months at a time they feel encouraged to accept bribes from criminal organizations to allow the export of illegal ivory . In cases where rangers are dutifully doing their jobs to protect the elephants in their care, they are often faced with serious danger from armed poachers. In December, 2016, Bruce Danny Ngongo, a Cameroonian ranger was shot and killed by poachers in what has become a string of violent ambushes in the country . Judicially, the illegal export of ivory is a low-risk enterprise for participants, as lawmakers in various African countries do not view these crimes as high priority . This allows government officials, both high and low ranking, to take a nonchalant approach to policing the ivory supply chain . High-ranking officials benefit from this export because the economies of many typically poor countries such as Malawi, Gabon, and Republic of the Congo receive an immense boost from the revenue generated by tusk trade . Large bribes are also taken by low ranking officials monitoring the supply chain, as they feel no threat of being prosecuted for doing so . Individual cases of bribery and embezzlement of funds between officials and criminal organizations undermine incentives to promote community resource management, and place governmental priority on economic elites, rather than affected stakeholders of elephant poaching . Corruption continues to persist in the ivory trade despite improved efforts to increase numbers of both African savanna and forest elephant populations. The fact that conservation sectors of government hold little power is the foremost reason for this. When compared to other facets of government such as armed forces, conservationist groups do not have the capability to prevent these wrongdoings . Furthermore, these groups are mainly funded externally, meaning there is a constant pressure to appease the donors, often leading to embezzlement of funds . The limited data on African elephant population estimates does not promote transparent governance, and allows poachers to freely hunt without fear of retribution . These transgressions committed by government officers continue to be a major issue for non-governmental organizations, and conservationist groups. Substantial evidence has been collected by scientists, agencies and epistemic communities, and most investigations are publicly available in the form of paper and online articles. Supporting knowledge of a significant decline in the African elephant species has left no choice but to globally recognize this environmental issue. 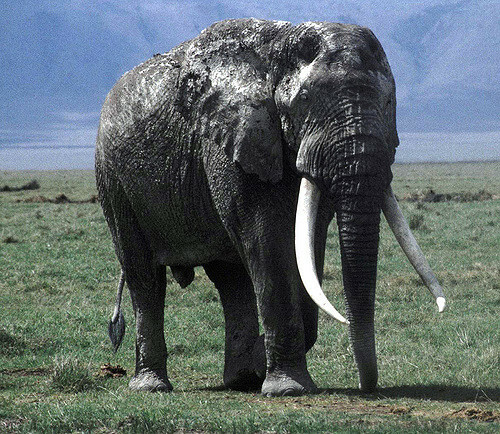 Proboscidea is a taxonomic order of chordate mammals which developed sensitive notable trunks and hard ivory tusks . Proboscideans were once a widely diverse group of mammals, as noted in the fossil record, and they still have living relatives like the Hyraxes. Elephants, and elephant like species have occupied both a spiritual and cultural presence within human museums, temples, schools and literature . Elephants as a species display similar characteristics to those of humans like having strong mother calf bonds, teaching others skills and caring for the sick and the elderly. They form complex connections to other elephants. Being the biggest land animal certainly has benefits and limitations as brain size is closely correlated with intelligence ;it is said that an elephant never forgets. The Matriarch influences the behaviors of its family group, remembering feeding areas and water holes, both within their home range and when tracing migratory routes . Traditional knowledge of the land is gained only by learned experiences that are associated with size and age, it is essential to past down inter-generational skills and knowledge to future generations. The matriarch is the leader of the family herd which is most often a group of related females. She is usually one of the oldest elephants and has experience caring for the calves, following migration routes and teaching the other elephants. There are many types of literature and media that focus on elephant behavior and morphology. These outlets are important to educate people about the environment, alternate ecosystems, and the intrinsic roles of biota on earth. These pieces allow humans to think about our own roles and impacts. A rationalized and comparative evaluation of technological, financial, scientific and legal resources should be considered on both the local and international levels when planning for remedial actions. Practice of the precautionary principal encourages one to consider the state of the world and its resources which will be passed on to the next generations. Cultural, political, economical and ecological repercussions should be considered if elephants were to no longer exist in the wild. Stakeholders and local peoples well-being and points of view should be sought after, including them when planning for new zoos and sanctuaries or when implementing new programs, practices and legislation. Children should be involved; this world will become their world as the issues of today will be theirs to solve in the future. Understanding relationships and evolution allows for more accurate risk assessments and projections of possible future outcomes, which allows for better regulation and management of endangered and invasive species. Due to better technology like DNA sequencing an increased understanding about genetic variation among species, subspecies and individuals has driven taxonomic reclassification, helping scientists understand evolution trends. Subspecies may continue to arise due to the potential isolation of small fragmented groups. Genetic drift affects small gene pools more intensely leading to a rise in genetic differentiation from the greater population. The interconnection of life remains a hot topic for many environmentalists and scientists. The need for fair governance when addressing environmental issues is great. Many problems like pollution, deforestation and defaunation occur nationally, yet they threaten global biodiversity and well-being. Unity of nation-states through intergovernmental bodies must be successfully achieved to better evaluate the scope and impacts of certain issues. Collaboration of scientific and technological data among communities incorporates a wider range of perspective, skill and knowledge which are valuable when dealing with complex issues that have huge costly repercussions. The equity and debt of environmental resources should be spread, as no one nation should have to face the costs of environmental issues alone, when globally humans all have a significant amount at stake. In the case of elephants much of Africa was once inhabited by either forest or Savanna elephants, yet many countries' elephants have become extirpated. A successful rebound should be sought after by all countries which once housed elephants. Collaboration of resources and efforts within these nation-states would provide a bigger framework of support to more effectively manage populations. A comprehensive destination-orientated understanding and classification of domestic ivory trading might help to regulate trade from its sources, encouraging a more nationally cooperative approach to African elephant conservation . This would include unanimous agreement of African nation-states about the appendix status of African elephants based on CITES classification of Endangered populations. A well developed frontal lobe in combination with a developmental society stimulates individuals to acquire complex behaviors and create culture. These trends are common amongst other groups of mammals such as primates, dolphins, whales and humans. Bull elephants have been exploited to the point where few ever age past 40, since it’s known they have the biggest trunks . It is recommended that males, who are solitary in nature be managed- tracking collars could be affixed to males as an option to assess in the movements and activities of individuals. Viable healthy sires are essential to the sustenance of future generations . As older dominant males become more uncommon wild poachers must turn to females and younger males, where more individuals must be sacrificed to maintain the same quantity of this white gold  A collaborative approach should be organised by outreach groups and utilized by multiple African communities. These have often been shown to be most effective in addressing and planning environmental issues. Involving and generating interest and involvement takes the weight off enforcement and places it on the shoulders of many individuals. The main debate with regard to economics is whether or not the ivory trade should be made legal again. The key point in this argument is that if the market is supplied with legal ivory, there will be no incentive to obtain ivory illegally, allowing governments to monitor elephant populations across Africa . However, historically, since this approach has been a major failure in the past, there is little motivation to try it again. Moreover, by using the years leading up to the ivory ban as an example, one can see many reasons why removing the ban would be ineffective for both the African peoples and for the country’s economy. Governments take a portion of the blame due to the fact that the profit gained from legal ivory sales is not reinvested in elephant conservation or the communities that work alongside them, therefore there is no incentive for the local peoples to encourage the killing of elephants for their ivory as there is no profit in it for them . Additionally, many parts of Africa encourage tourism through safaris and trips through the bush to see the local wildlife of which elephants are a huge part. For example, Tanzania generates over 17% of its gross domestic product through tourism, much of which is wildlife tourism , which indicates a greater benefit for locals through saving elephants rather than killing them. These factors reveal that placing a total ban on ivory trade in Sub-Saharan African countries is far more effective than allowing some legal export, as there are much more economically sufficient alternatives. Governments are reluctant to act due to ivory poaching having been linked with army militias such as the Lord’s Resistance Army, linking the illegal selling of ivory with the much larger problem of national security. The reluctance to stir up more trouble with African militias is not unfounded, however the longer they wait the more stable the illegal trade becomes within international criminal networks . Some of these networks have found loopholes around the Ivory Ban, allowing the legal markets to create a laundering mechanism for illegally obtained ivory  and driving up the prices due to the risks taken by poachers and smugglers. Without international regulation in the form of de jure law or treaty, enforcement of anti-poaching regulations in Sub-Saharan countries will remain difficult. CITES has been productive in efforts to cease the harvest of illegal ivory . This treaty contends that with sustainable regulation quotas on ivory and improved estimates on African elephant population numbers, it is possible to develop a legal ivory trade . Internationally bound treaties such as CITES are the best method to enforce parameters regarding ivory, as they hold governments and the police accountable for their actions through their transparency, on a multilateral level. International regulations do not always work in regards to poaching however, and can sometimes even have negative effects on conservation. For example, completely banning the trade of elephant tusks makes the item more valuable, increasing the reward and incentive to hunt for local poachers . Since the majority of elephant poachers are simply poor villagers attempting to make a living, the best method for governments to enforce anti-poaching laws is decentralization combined with international regulations . It is important to provide villagers with tools to earn an honest living, without destroying endangered habitats. Some examples that have worked worldwide pertaining to other valuable goods have been training these people as eco-tourist guides, selling shares for rights to hunt, and practicing situational crime prevention, which is the notion that any individual is capable of committing a crime at any given time . Non-governmental organizations (NGOs) play an important role in creating international awareness in the trade of ivory as well. The reason such vast amounts of ivory are being exported out of Africa is due to the high demand for the product in wealthy nations such as China. NGOs provide an outlet for citizens to voice their opinions regarding illegal ivory trade, and increase awareness on the issues. Specific NGOs such as World Wildlife Fund (WWF) and Save the Elephants have been consistently successful in decreasing demand for ivory in China . This has not only placed more pressure on the Chinese government to potentially ban incoming ivory, it also reduces its value as a resource in general . A decrease in worldwide demand creates less incentive to poach, and fewer governmental bribes along the supply chain in African countries. Viewed through the lens of other disciplines and professions, what other factors/perspectives become relevant when considering solutions to address challenges associated with declining African Elephant population? What special expertise, resources, or theoretical orientations might others bring to help us better mitigate challenges associated with declining African Elephant population? It is becoming more and more essential to tackle policy loopholes to tighten the control of ivory trade, both domestically and internationally. Effective cooperation can help with the regulation, policing, and monitoring of markets. Efforts from NGOs, governments and citizens have stimulated public awareness and generate conscious thoughts of environmental issues amongst individuals. These notions should be integrated into future community based projects, targeting root-issues in realistic contexts based on factual understanding about the motivations of stakeholders, consumers and the markets. ↑ 1.01.11.21.31.4 Holbrook, J. (1977). A Closer Look at Elephants. New York: Franklin Watts. ↑ 5.05.15.25.3 Laidlaw, R. (2014). 5 Elephants. Markham, Ontario: Fitzhenry & Whiteside. ↑ 6.06.16.26.36.4 Morgan, J. (2004). Elephant Rescue: Changing the Future for Endangered Wildlife. Richmond Hill, Ontario: Firefly Books Ltd.
↑ Freudenberg, N. (1984). NOT! In Our Backyards: Community Action for Health and the Environment. New York: Monthly Review Press. ↑ 13.013.113.2 Smith, R. J., Muir, R. D., Walpole, M. J., Balmford, A., & Leader-Williams, N. (2003). Governance and the loss of biodiversity. Nature, 426 (6962), 67-70. ↑ 16.016.116.2 Wasser, S. K., Joseph, C. W., Drori, O., Stephen, K. E., Mailand, C., Mutayoba, B., & Stephens, M. (2008). Combating the illegal trade in African elephant ivory with DNA forensics. Conservation biology: the journal of the Society for Conservation Biology, 22(4), 1065. ↑ Smith, R. J., Biggs, D., St John, F. A., t Sas‐Rolfes, M., & Barrington, R. (2015). Elephant conservation and corruption beyond the ivory trade. Conservation Biology, 29(3), 953-956. ↑ 18.018.118.2 Lusseau, David, and Phyllis C. Lee. "Can we sustainably harvest ivory?" Current Biology 26.21 (2016): 2951-2956. ↑ 19.019.119.2 Pires, S. F., & Moreto, W. D. (2011). Preventing wildlife crimes: Solutions that can overcome the ‘Tragedy of the Commons’. European Journal on Criminal Policy and Research, 17(2), 101-123.